he'll offer you a light. on another long knife night. The news that there was a ‘New Sheriff in Town’ in the religious kingdom of Saudi-Arabia became already apparent a few months ago. This happened with the appointment of Prince Mohammed bin Salman, as the official crown prince for his father, King Salman bin Abdul Aziz. Few people outside Saudi Arabia had heard of Prince Mohammed bin Salman before his father became king in 2015. But since then, the 31-year-old has become the most influential figure in the world's leading oil exporter. He has now been elevated to the position of crown prince, replacing his cousin Mohammed bin Nayef - a move that had been widely expected and could shape the direction of the country for decades. Mohammed bin Salman's rise to power began in 2013, when he was named head of the Crown Prince's Court, with the rank of minister. The previous year, Salman had been appointed crown prince after the death of Nayef bin Abdul Aziz - the father of Mohammed bin Nayef. In January 2015, King Abdullah bin Abdul Aziz died and Salman acceded to the throne at the age of 79. He immediately made two decisions that surprised observers, naming his son minister of defence and Mohammed bin Nayef deputy crown prince. One of Mohammed bin Salman's first acts as defence minister was to launch a military campaign in Yemen in March 2015 along with other Arab states after President Abdrabbuh Mansour Hadi was forced into exile by the Houthi rebel movement. The appointment of Prince Mohammad bin Salman to official crown prince – after he allegedly organized a hostile knock over at gunpoint against former crown prince Mohammed bin Nayef – was more or less expected by pundits, but it was nevertheless a surprising and very important move to the eyes of the outside world. A move that (again BBC) “could shape the direction of the country for decades”. Especially because of the very young age of the crown prince, who was only in his early thirties and could theoretically lead the country for at least fourty years. The Kingdom’s tremendous prosperity was traditionally based upon the country’s seemingly endless flow of oil, that was pumped up since the start of the twentieth century, and the gazillions of dollars that the eternally oil-hungry Western World paid for this continuous flow towards the West. Especially in the United States, the cheap gasoline for the infamous V8 gas guzzlers and the energy for the fully airconditioned homes in deserts like Arizona and Nevada seemed to have become a human right, that must not be abolished at all cost. And Saudi Arabia was happy to deliver to the 'infidels' in the West, in exchange for their dollars and weapons. 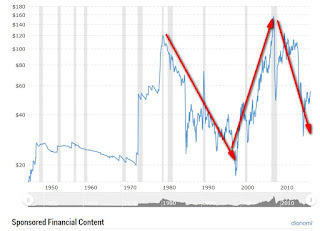 However, since 2008 the global economic breakdown, that emerged from the American sub-prime mortgage crisis, struck the middle and lower classes of the world at a nearly unprecedented scale. Hence this led to less consumption worldwide. And thus to less stores and shopping malls, less imports and exports and less truck transport and commuter miles in the Western countries. And this all happened at a blistering scale that even forced the mostly ignorant, energy squandering middle-class Americans to look for more fuel-efficient ways of living and driving, in order to save a few bucks. This fuel (and thus oil)saving effect was even reinforced by the emergence of the internet and (in its wake) online shopping. It was especially online shopping that – in combination with the depression-like recession – acted like a doomsday clock for many brick and mortar store chains, which all suffered from diminishing numbers of customers and diminishing sales. 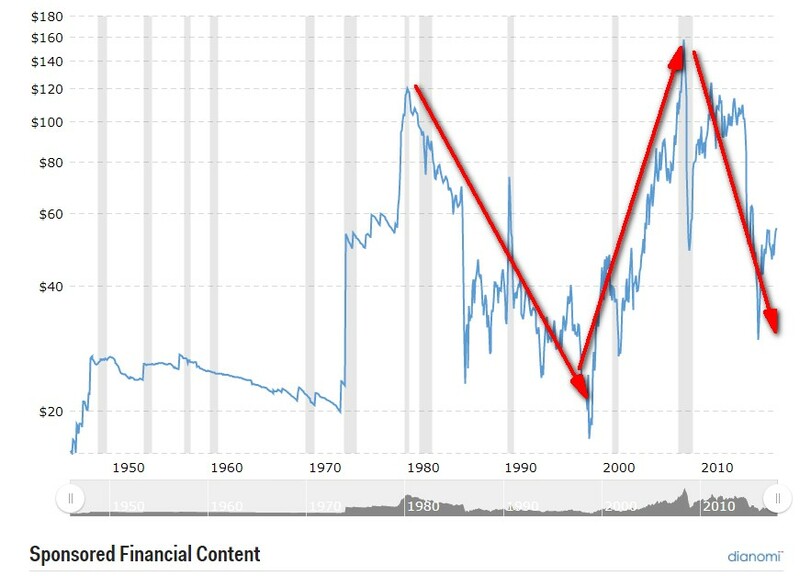 This all caused that the oil price per barrel in 2014 dropped to levels well under $60 (source: Macrotrends.net) for a number of years in a row. This sheer event was responsible for acute economic problems in Russia, Venezuela and also Saudi-Arabia, as all three were very large oil exporters that – in the process – were almost totally dependent on their energy sector as their main source of national wealth. And on top of that, Saudi-Arabia had also come under fierce pressure from the important insight that the flow of oil towards the West and the returning flow of Euros and dollars towards their treasury would not be endless after all. Under pressure of the emerging, potentially catastrophic climate change, the West was finally moving towards a less fossile fuel driven future, by adapting (partially) electric cars and doing research into hydrogen-driven cars that would not produce the exhaust, which made gasoline and diesel cars so bad for the global environment. This meant that Saudi Arabia needed to adapt its economy from being almost solely oil-driven to something more modern that prospered from other sources of income, like air transport, tourism and hospitality or state-of-the-art technology and innovation. All this should be akin to what already happened in Dubai, Qatar and the other gulf states. These countries built new sciencefiction-like cities, mega-airports, the sky-is-the-limit hotels, skyscrapers that reach into the clouds and bedazzling shopping malls with skiing slopes(!) in the desert at 50 degrees centigrade. And Saudi Arabia – as the natural leader of the pack in the area – must preferably do it better and with more royal grandure. That is still the challenge for which the country stands. Another specific Saudi-Arab problem is the swelling number of princes and other royalty, with their respective court circles within the kingdom. And all these princes and officials want to have a slice of the pie of the tremendous wealth of the Saud family, based upon the oil of the country and the countless offshore and building projects that happen overthere. In the past this already led to the infamous and widespread Saudi-Arab corruption and “quid pro quo” mentality, driving most Western oil, offshore and building companies crazy. This unavoidable corruption led to priceless projects on the Arab peninsula, of which at least 40% of the final invoices was paid in bribery money, meant to pay off everybody and their sister. No slush money?! Then no projects! Take it or leave it!!! This ubiquitous corruption, in combination with the notion that the peace and quiet within the country could only be upheld with a topheavy welfare state, as well as with the suppression of minorities, like immigrants, women and (religious) opposition, made things even worse for the rulers of the Kingdom. Total suppression of people costs a lot of money: also in times of low oil prices, when the influx of dollars is not so obvious. This is one of the reasons that the Arab state oil company Aramco is cautiously brought to the global stock exchanges. When the oil does not yield sufficient money anymore, than the firesale of the underlying oil companies must do the job. But the undisputed elephant in the room for Saudi Arabia is their extremely rigid version of the Islam. The Wahabism, as it is called, seemed to be one of the underlying causes for the emergence of Al Qaida and ISIS terrorism in the world. Especially this Wahabism increasingly alienated the Western World from the desert kingdom, as did recently the seemingly endless and very bloody proxy war against Iran in Yemen. Mix all this together and one has a very poisonous mixture for the future of the desert kingdom. Enter Prince Mohammad bin Salman as the new crown prince and de facto the new man in charge in Saudi Arabia, under the cover of old King Salman, who is probably the leader of the country in name only. All this was a shocking new development for these Saudi Arab women that previously had nothing to say and nothing to do without the consent of their man and “owner”, in the country that was almost akin to a medieval kingdom in Europe. When the country eventually promised to return to a less rigid form of the islam one week ago, the Western world was happily surprised and full of expectations about the winds of change in the country. Yesterday, however, the world saw two events in Saudi Arabia with probably large implications for the desert kingdom. First, a Burqan 2H long range missile – allegedly fired by the Houthi rebels of Yemen – was intercepted above the airport of Riyadh. This could push the envelope even further for this bloody war between Yemen and Saudi Arabia. And even more important: yesterday saw the establishment of an anti-corruption bureau in SA, And this bureau directly came into action by arresting a few, very high profile leaders and officials within the country. 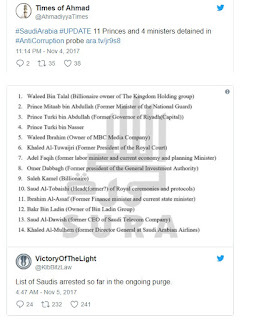 Saudi Arabia has arrested dozens of princes, senior military officers, businessmen and top officials, including a well-known royal billionaire with extensive holdings in Western companies, as part of a sweeping anti-corruption probe that further cements control in the hands of its young crown prince. Well, I have news for you: the arrests themselves are a fact, but IMHO these arrests have nothing to do with an emerging war against corruption in the country, even though the large news outlets are reporting this as news. Fourty years ago, when my father worked for a large building company in The Netherlands, doing business with Saudi Arabia simply meant paying massive amounts of bribe money to everybody with a status and an important role overthere. And now about half a century later hardly anything has changed with respect to that: only the royal family became much, much bigger, as became their need for (bribe) money. In my opinion, the notion that Saudi Arabia will become less corrupted as a consequence of these dozens of arrests, is therefore preposterous. For the simple reason that the chance that something with such a long history as corruption in Saudi Arabia changes overnight, is minute. 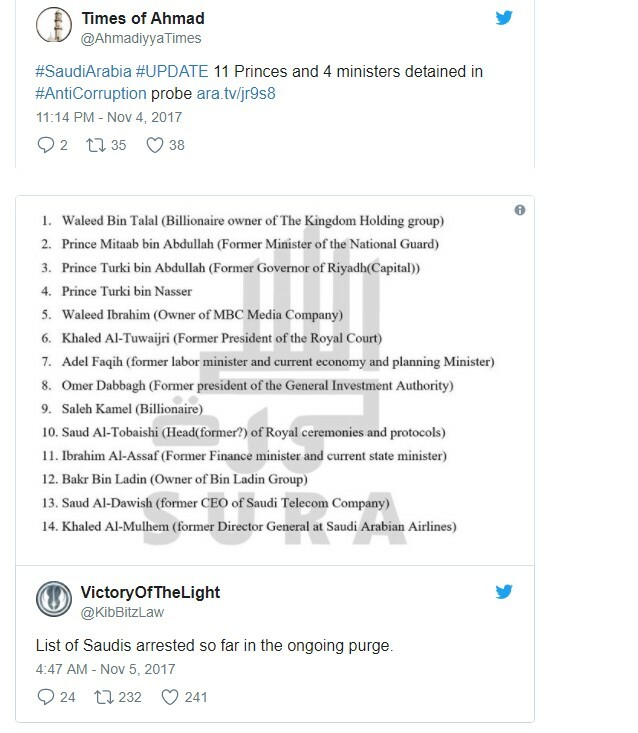 As far as I’m concerned, what happened yesterday was nothing less than a Night of the Long Knives: a coup d’etat executed by the (new) people in charge of Saudi Arabia in order to wipe out all their political opponents! In this case under the moniker of “fighting corruption”, which is probably not a very hard case to proof overthere, but not the real reason at all. And to be frank with you: last night can be the beginning of something that could very well end up in a civil war in Saudi Arabia. This might happen, when the largest factions within the huge Saud family decide to take an aim at each other, using the countless American weapons stashed away in the country to take up the fight. Expect more arrests and perhaps more deaths to emerge from these events very soon. And expect more and harsher suppression of everybody who does not agree with the official line of leadership in the country. Fighting corruption is a container that can cover a lot of actions, executed by the powers that be. Prince Mohammad will play for keeps to get/stay in charge of the country, as there is no turning back for him anymore. And so will his adversaries, as far as they have not been arrested yet or left the country in the meantime. The only chance of these events not ending in a massive bloodshed, is when the former rulers understand there is a new sheriff in town indeed. In that case they will cut their losses soon and sit still while being shaven. However, the chance that the family (and future heirs(?)) of billionaire Prince Alwaleed bin Talal wave their massive wealth goodbye without a fight, is very dim in my opinion. As long as these people can make use of the vast bank accounts of Prince Alwaleed, they can call for help from all directions, including the American army or even private soldiers of fortune from South Africa or Israel. The same is true for the former crown prince Mohammed bin Nayef and his family, who now all should worry about their health and – as a matter of fact – their sheer survival of these emerging events. They will probably also not give in without a fight to the new rulers of the country. Will they continue their life of exuberant wealth? Or will they flee the country as rich exiles, in order to not end on the infamous Chop Chop Square, where all the public executions take place. And even though everything behind all this is still very well under the cloak of secrecy, I am darn sure that it is not the war against corruption that caused these events. No way! So the worst has probably yet to come in Saudi Arabia, as more and bloodier events will undoubtedly unroll in the coming weeks and months. This all is not about enhanced freedom for women. And probably also not about a more enlightened view on the Islam overthere. Those were all just words to lure the Western countries into accepting the new leadership of Saudi Arabia. But a different view on religion? Seeing is believing, but I don’t see it coming soon. This all is just a grab for absolute power: a Night of the Long Knives! Soon, part II in this story about Bernie Sanders: the best President the United States never had!